The past is what it is because it is what it is… past, gone, done with. As long as we can’t go back in time, then those things should be left where they are. Stop beating yourself up about the mistakes, hurts and failures of the past… The past ten years or past ten minutes. You can’t go back to change it, but you can face the future and make things right, better than what it was. Sometimes the past holds great memories… but they are gone, just a picture in our minds, create better ones for the future… move on. In the new, don’t be so tormented and broken by your past that you shut up. Don’t let your past judge you, don’t let your past silence you; don’t let your past put you in a cage, in a cell of guilt and condemnation. It’s called your past because you moved away from it. Its called your past life because you made a conscious effort to change, to be better. You made a decision, that decision creates a blank canvas for you to explore and make beautiful. This post on instagram inspired my post. Sometimes we’re comfortable in the pain of the present because we feel like we have to pay a price for the past… we’re comfortable in that life that is less than satisfying because we were such horrible beings in the past, we did such horrible things and that's the price we pay… But haven’t you heard? God so loved the world…. He gave us His only son to die for us, to pay the price for our foolishness. Meaning, He loved us even when we were yet sinners, even when we were yet horrible, even when we were yet drunks and robbers and liars and thieves and murderers and prostitutes and fraudsters and cheats. It’s hard to believe… it’s hard to understand a love so strong, a love that looks beyond us, and our filth. 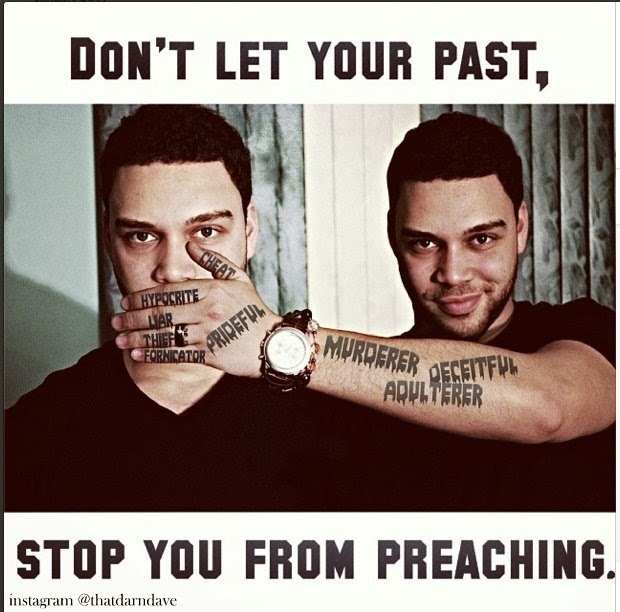 As long as you are now in Christ your past doesn’t matter. He’s wiped it clean with His blood. In the natural, blood only leaves more hideous stains, but in the spiritual, the blood cleanses and makes as white as snow. If you are in Christ, you don’t have to pay any price with God… saying you have to pay the price of suffering in your present because of your past is making null and void the sacrifice of Jesus on the cross. That sacrifice was the price paid. We are debt free as long as we are in Christ. “Our God who is not limited by time can heal your past hurts and lead you into the bright future He has prepared for you.“ Joseph Prince. Paul was Saul, the one who persecuted the Christians, he was there as a participating witness when Steven was stoned to death, and probably involved in so much more. He had every reason to cower in shame and shy away from being bold for Christ after his shameful acts “…but this one thing I do, forgetting those things which are behind, and reaching forth unto those things which are before,” Philippians 3:13 He chose to forget the past and move forward in boldness preaching and winning souls clothed in grace and God's love and forgiveness. Let go of the past; make a conscious effort to enjoy the beauty of the present in the New Year. Ignore the voice of judgment, shut out the voice of condemnation and preach your heart out, and enjoy life, and believe God is speaking to you when you read His words of love, saying He loves you, you are His righteousness in Christ, and you are seated at His right hand in the heavenly places, and you are more than a conqueror. Be expectant, be ready to receive an overflow of His blessings and His goodness in the new, despite your past. "Stop allowing what happened to you to control what’s left of you." Bishop TD Jakes.